That’s how we were for the duration of our stay in Manila. Our hosts, O and D, really know how to take care of their guests. The warmth and hospitality that we were fortunate to experience far exceeds the five star rating in hotels. Because I’m sure just like you guys, nothing beats the feeling of being with family meal after meal with the accompanying conversations filled with laughter. As a bonus all your needs are taken care of, you have nothing to worry about. You are definitely on vacation mode, as their well trained household crew treats you like family. (Thank you D and O and to the rest of your household crew! 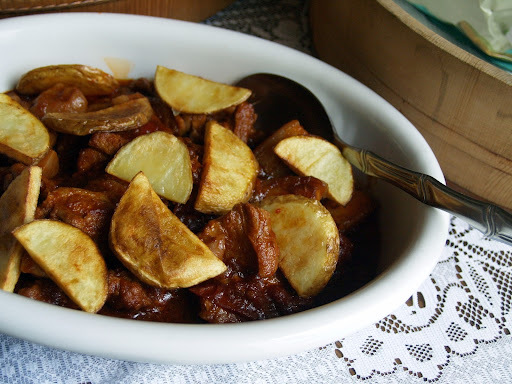 For today’s post I would like to share what Lani calls Pina-Asadong Baboy sa Kamatis (Tomato Braised Pork) The soft and tender pork that was slow cooked to perfection will knock your socks off. Thank you foodipino.com. for posting my recipes. And to all the readers, thank you for stopping by. You could find more of my recipes at my blog Skip to Malou or let’s be friends on Facebook and Twitter! I’ll make this tonight. It’s a potential family-favorite. Thanks for sharing. I’m always cooking that recipe. We call it Kinamatisang baboy. easy to do and yummy to eat! Same question. I’m cooking it right now, but I wonder if the stock will be thrown or included at the final step. Hello, sorry I just saw your questions I hope makaktulong pa tong sagot ko. Yes isama mo yung tubig na ginamit sa pampalambot. Actually niluto ko nung isang araw lang yan ulit at yung tubig na pinampalambot ay halos wala na rin so kaya isama mo siya. na try q n po syang kainin….actually di sya familiar the first tym n inulam q…ung cook po sa opis canteen nmin ang nagluto…pro gusto q din try sa bahai ….easy nman po ang procedure at mdali ang ingredients…slmat po sa recipe….kinamatisang baboy nga po din twag dito…. pls post some food picture and recipe to my timeline. Thanks po for the recipe!